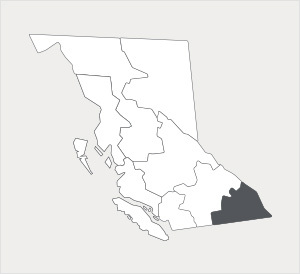 In BC’s southeast we find the Kootenay region. Bordered by Alberta and the United States, the region’s valleys are separated by the ruggedly famous high mountains of the Canadian Rockies. In the Rocky Mountain Trench and Grand Forks area cattle ranching is prominent, while in the Creston Valley fruits and vegetables reign supreme*. Ranches dominate roughly 1,350 of the region’s farms, but a moderate climate gives the area the ability to support a wide range of crops, from apples and cereals to vegetables, tomatoes, and cabbage*. Kootenay’s mountain slopes feature summer grazing for livestock while hay and cereal are grown for winter in the valley bottoms. A small food and beverage processing sector features local meat, honey, fruit, and vegetables*. Increasingly locals understand and appreciate and benefit from the dairy, brewing, and livestock feed all made right in their backyards. Ktunaxa, the traditional name for Kootenay, was derived from the First Nations who first inhabited the region. The Ktanaxa word “Quthni” means “to travel by water”. The rivers served First Nations locals for thousands of years, just as they serve today’s ranchers and farms with much needed water and power**. *Source: Agriculture in the Classroom, Canada. “A Guide to BC Agriculture Resources”. Pg. 21.